A single transducer ultrasonic imaging method that eliminates the effect of thickness variation in the image, and its application to plate and hollow tubular ceramic materials, are described. The method thus isolates ultrasonic variations due to material microstructure. Its use can result in significant cost savings, because the ultrasonic image, and consequently assessment of material and manufacturing quality, can be interpreted correctly without the need for precision thickness machining during nondestructive evaluation stages of material development. The thickness-independent ultrasonic imaging method is shown to provide more accurate and quantitative materials characterization as compared to that for conventional ultrasonic c-scan and apparent velocity images. The method has been commercialized via a cooperative agreement between NASA Lewis Research Center and Sonix, Inc.
Ultrasonic c-scan imaging is an effective nondestructive evaluation (NDE) technique used for materials analysis and quality control in the aerospace, electronics, and other industries . C-scan imaging in its most conventional implementation is used to map variations in ultrasonic echo peak amplitude that occur when scanning across a material part . In the pulse-echo c-scan configuration, echoes that are sometimes monitored or "gated" include those reflecting off the sample front and back surfaces . For currently available commercial scan systems, the amplitude variations are generally scaled to values between zero and 255 [8-bit dynamic range] and displayed on video in terms of gray or color scale. In this manner, gray scale variations in the image are associated with amplitude, or attenuation, variations. An additional implementation of c-scan imaging involves mapping variations in the time of occurrence of an ultrasonic echo peak with respect to a reference time. These "time-of-flight" variations are scaled and displayed in a similar fashion to echo peak amplitude. Both amplitude and time-of-flight variations of a back surface echo can many times be related to variations in a volumetric microstructural property such as density which can affect physical material properties such as stiffness and thermal conductivity. However, a weakness of conventional ultrasonic c-scan imaging regarding both peak amplitude and time-of-flight modes is that gray scale variations in images for back surface reflections indicate part thickness variations as well as microstructural variations unless the part is uniformly thick. Figure 1. Effect of thickness on ultrasonic echo peak amplitude for PMR-15 polymide sample. d = thickness. (a) Rectified back wall echo for two thicknesses using 5 MHz broadband trans- ducer. (b) Percent increase in back wall echo peak amplitude versus decrease in thickness. such that velocity is inversely proportional to time-of-flight. For velocity mapping from scan results, only one thickness value can be used practically in the velocity map calculation (eq. (3)). This thickness value is usually an average value obtained from several measurements at different sample locations. For scan locations where actual thickness is less than the value chosen for the calculation, time-of-flight will be less, and apparent velocity will be greater, than that if the scan location had the chosen value of thickness. The situation is opposite for scan locations where actual thickness is greater than the value chosen for the calculation. Hence, velocity and time-of-flight maps will be affected similarly (although inversely in terms of magnitude) by thickness variations, and velocity maps are used in this investigation to indicate time-of-flight variations. Since the attenuation coefficient ( ) and velocity (V) in a material will not be constant if microstructural variations are present, eqs. (1) to (3) indicate that maps of peak amplitude, time-of- flight, and velocity will show a combination of microstructural and thickness variations. Several attempts to account for thickness variation effects in ultrasonic measurements were noted in the literature. Reference  used a two-transducer method whereby the transducers, located on opposite sides of the sample, were used in both pulse-echo and through-transmission mode to produce thickness-independent peak amplitude c-scans. Accurate thickness at each scan location was obtained via both transducers using the time-of-flights acquired from pulse-echo front-surface reflections off both surfaces of the sample, and using the known constant velocity in water and the known distance between the two transducers. Peak amplitude information was obtained in through-transmission mode. A peak amplitude c-scan free of thickness effects was then computed using eq. (1) where A, A0 , d, anda were the thickness-corrected peak amplitude, measured peak amplitude, measured thickness, and assumed constant material attenuation coefficient, respectively, at each scan location. Reference  also used a two-transducer method, but the transducers were employed solely in pulse-echo mode to produce thickness-independent ultrasonic velocity images. Thickness information was obtained in a similar manner to that described for ref. . Additionally, time-of-flight from the first reflected pulse off the sample back surface was obtained by one of the transducers at each scan location. Knowing thickness (d) and time-of-flight (2t) at each scan location, thickness-independent velocity (V) images were calculated according to eq. (3). Figure 2.-Ultrasonic pulse-echo immersion testing. (a) Schematic of ultrasonic pulse-echo immersion testing. (b) Resulting waveforms. where T is temperature in °C. Water velocity can also be determined by direct measurement using the time difference of ultrasonic wave travel in water between two transducer heights. This thickness-independent ultrasonic imaging method does not require prior knowledge of sample thickness as shown in eq. (4), and, if engineered for scanning, the effect of thickness variation is eliminated in the resulting image. Precision and accuracy associated with this method are estimated at nearly 1% as described in ref. . The methods of refs. [2 to 10] all require access to both sides of the sample, i.e. there is not a single-sided technique available for scanning that will result in thickness-independence. 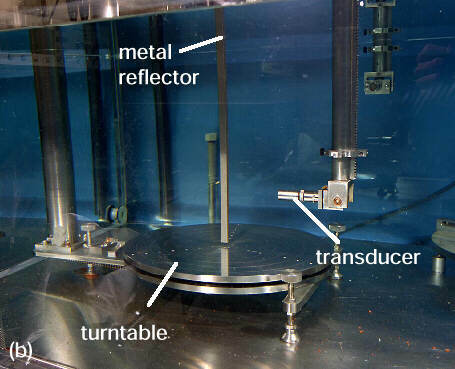 In this investigation, the single-transducer-reflector plate method of refs. [4 to 10] and fig. 2 is applied to obtain thickness-independent ultrasonic images of monolithic silicon nitride ceramic plate and hollow tubular materials. Thickness-independent ultrasonic images for these materials are compared to c-scan peak amplitude images and apparent velocity images (the latter being obtained using eq. (3)). The single-transducer-reflector plate method was chosen over the two-transducer methods because of its simplicity and potential applicability to inspection of hollow tubular samples currently being fabricated for high-temperature structural duty. Some of these tubes recently inspected at NASA by ultrasonic methods have inner regions too small to contain a perpendicularly-positioned second transducer but large enough to contain a reflector plate. The silicon nitride plate material was in the form of a wedge of nominal thickness 3.3 mm and 36 mm length, and it had a 0.3 mm edge-to-edge thickness gradient (lengthwise) (approximately 10% of total thickness), 3 areas of higher-than-average (HTA) pore fraction (approximately 3 to 5% HTA as determined from optical analysis) and an edge-to-center pore fraction gradient of 2 to 3%. The thickness gradient was machined into the wedge. The silicon nitride tubular material was of nominal wall thickness 7.5 mm, 48 mm outside diameter, and 150 mm height. It was manufactured unintentionally with a 0.8 mm thickness variation (approximately 10% of total thickness) and currently unknown microstructural variation. The thickness-independent ultrasonic imaging method requires at least two scans to collect the necessary echoes required for calculation of time delays (fig. 2). The first of two scans is run with the sample in place, and echoes B1 (first back surface echo), B2 (second back surface echo), and M' (first echo off reflector plate front surface with sample present) are collected. Following this, the sample is removed and a second scan is run to collect M" (first echo off reflector plate front surface with sample removed). In this investigation, three scans were used to obtain all echoes as required using the version of this method that is commercially-available . B1and B2 are obtained in scan 1, M' is obtained in scan 2, and M" is obtained in scan 3. A computerized cross-correlation method was used to calculate precise time delays . The silicon nitride wedge was ultrasonically scanned with a 20 MHz (nominal center frequency) broadband unfocused transducer to obtain apparent velocity and thickness-independent velocity images, and additionally scanned with a 50 MHz broadband spherically-focused transducer to obtain conventional peak amplitude c-scan images. A machined tungsten reflector plate was positioned approximately 1 cm beneath the wedge. An 800 MHz analog-to-digital sampling rate was used during data acquisition. The scan grid was 45 by 90 points with a 0.5 mm scan increment for the apparent velocity and thickness-independent velocity scans, and 90 by 180 points with a 0.25 mm scan increment for the peak amplitude c-scan images. The scan set-up for the wedge is approximated by the schematic of fig. 2. 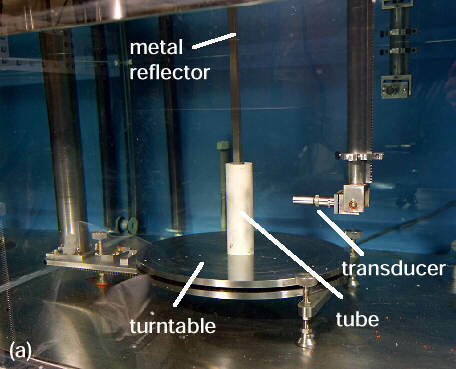 Figure 3.-Ultrasonic set-up using turntable scan for application to tubes. (a) Scan 1: sample present, collect B1, B2, M'. (b) Scan 2: sample removed, collect M". Images were contrast-expanded to better reveal global material variation by filtering relatively high and/or low data values that occurred in very low numbers (stray data values). Further experimental details are given in ref. . The silicon nitride tube was ultrasonically scanned with a 10 Mhz broadband spherically-focused transducer to obtain preliminary apparent velocity and thickness-independent image results. Photographs of the set-up for the tube scan are shown in fig. 3. A 250 MHz analog-to-digital sampling rate was used during data acquisition. The tube was scanned using a turntable assembly upon which the tube was placed. The transducer was positioned perpendicularly to the tube. The turntable was spun so that one scan line corresponded to a full rotation (360°) of the tube. Ultrasonic echoes were acquired at 1° increments. After the turntable completed a full rotation and thus returned to the scan starting position, the transducer was raised in height by 1 mm so that a new 360° line of data could be obtained. The scan proceeded in this manner such that 105 lines of data encompassing most of the tube height were obtained. The resulting scan grid was 360 by 105 points. A machined stainless steel reflector plate was suspended from the scanner bridge and positioned internal to the tube approximately 1 cm from the inside wall. In this manner, the reflector plate remained stationary throughout the scan. Data filtering for contrast expansion of tube ultrasonic images was used as before. Figure 4. Ultrasonic images of silicon nitride wedge having pore fraction variations and a 300 µm thickness gradient edge-to-edge (lengthwise). (a) C-scan peak amplitude image where back wall echo was gated, 50 MHz. (b) Apparent velocity image, 20 MHz. (c) Thickness-independent velocity image, 20 MHz. Figure 5. Ultrasonic images of silicon nitride wedge, shown as 3-D renderings. Figures 4 and 5 show imaging results for the silicon nitride ceramic wedge with the 0.300 mm (10%) edge-to-edge thickness gradient (lengthwise), 3 areas of higher-than-average (HTA) pore fraction and an edge-to-center pore fraction gradient. Consider fig. 4. The peak amplitude c-scan image does not reveal the thickness or microstructural variations. This is likely due to the fact that the attenuation coefficient at ~50 MHz in silicon nitride (even with some porosity) is extremely low, such that a system with 8-bit digital dynamic range cannot resolve them. The apparent velocity image shows an ~10% velocity variation from top-to-bottom edge; some microstructural variation is evident but is mostly masked by the thickness variation. In this image, the HTA pore fraction area at the top of the disk is accentuated while the lower HTA pore fraction area is masked totally by the thickness gradient. In the thickness-independent image, the lower HTA pore fraction area is revealed, the top HTA area is de-emphasized, and an ~ 4% total velocity variation is seen. Additionally, the edge-to-center pore fraction gradient is disclosed. The latter image correctly portrays the microstructural condition in this material. Figure 5 shows three-dimensional renderings of the apparent velocity and thickness-independent velocity images which further highlight the differences between the results. Figures 6 and 7 show preliminary imaging results for the silicon nitride tube of nominal wall thickness 7.5 mm and 150 mm height having a 0.8 mm (10%) thickness variation and currently unknown microstructural variation. Apparent velocity and thickness-independent velocity results are shown in flat, unwrapped form (fig. 6) and decaled onto a cylindrical / tubular model (fig. 7). Both views can be useful depending on the scan results. For these results, the tubular views (fig. 7) prove more useful since major image indications appear 180° apart (rotationally about the vertical axis) from each other, and one of the features is interrupted by the image end in the unwrapped view of the apparent velocity image of fig. 6(a). A funnel-like feature containing concentric open contours showing decreasing velocity from tube bottom-to-top is indicated in the apparent velocity image decal of fig. 7(a). This feature disappears for the most part in the thickness-independent image of fig. 7(b), indicating it was primarily due to thickness variation. Consider an orientation for the tube rotated 180° (about the vertical axis) from the views shown in figs. 7(a) and (b). For this orientation, the images of which are shown in figs. 7(c) and (d), an oval-like feature is indicated in the apparent velocity image decal image of fig. 7(c). The oval-like feature contains concentric contours indicating different apparent velocity regions, but overall the feature shows higher-than-average apparent velocity as compared to the surrounding region. In the thickness-independent image of fig. 7(d), the overall oval-like feature remains, although the internal details have changed as compared to its portrayal in the apparent velocity image. The results of figs. 7(c) and (d) indicate that the features associated with the oval-like area may be the result of a com-bination of microstructural (possibly density/pore fraction) and thickness variation. Destructive testing with optical analysis is required to confirm these results. These preliminary results for the silicon nitride tube indicate the increased degree of inspection accuracy that the thickness-independent ultrasonic imaging method can provide for tube-type structures. Figure 7. Ultrasonic images of silicon nitride tube with ultrasonic info "decaled" onto cylinder model. (a) Apparent velocity, initial orientation. (c) Apparent velocity, rotated 180° with respect to initial orientation. This article described a single-transducer ultrasonic imaging method based on measurement of ultrasonic velocity that eliminates the effect of thickness variation in the image. The method thus isolates ultrasonic variations due to material microstructure. Results were shown for silicon nitride ceramic plate and tubular materials. 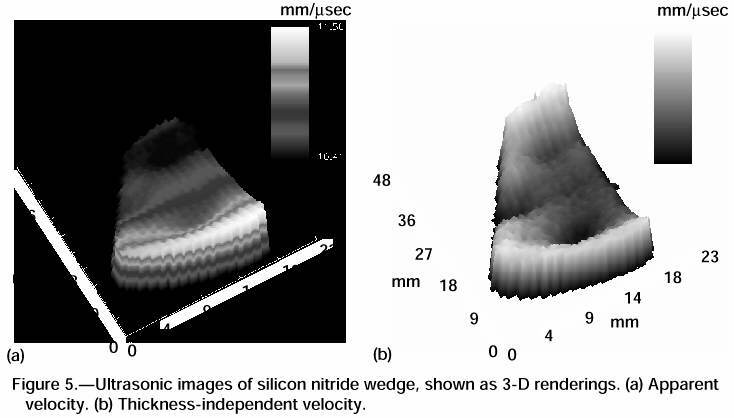 It was found that the peak amplitude c-scan image (gating the back wall echo) for the silicon nitride wedge was not visibly affected by the 300 µm (10%) thickness variation. Additionally, however, the peak amplitude c-scan did not reveal the microstructural variation in the wedge either. Apparent velocity images indicating time-of-flight variations showed significant superposition of thickness effects which masked the true picture of material microstructure for the silicon nitride wedge. For the wedge, the thickness-independent ultrasonic imaging method accurately quantified (in terms of velocity variation) the pore-fraction variations. For the tube, two major indications were revealed in the apparent velocity image results. Preliminary thickness-independent ultrasonic image results showed that one of these indications was due to thickness variation and that the other was likely a combination of micro-structural and thickness variation. Further characterization needs to be performed on the tube sample to confirm these results. The use of the thickness-independent ultrasonic imaging method can result in significant cost savings, because the ultrasonic image, and consequently assessment of material and manufacturing quality, can be interpreted correctly without the need for machining to achieve precise thickness uniformity during nondestructive evaluation stages of material development. Nondestructive Testing Handbook, second edition, Volume 7 Ultrasonic Testing, eds. A.S. Birks, R.E. Green, and P. McIntire, American Society For Nondestructive Testing, 227-230, 387-390, 405, 225, (1991). M. Bashyam, Thickness Compensation and Dynamic Range Improvement For Ultrasonic Imaging of Composite Materials. Proc. Of the 17th Annual Review of Progress in Quantitative Nondestructive Evaluation, La Jolla, CA, 10A. Plenum Press, 1991,1035-1042, July 15-20, 1990. J.J. Gruber, J.M. Smith, and R.H. Brockelman, Ultrasonic Velocity C-scans for Ceramic and Composite Material Characterization. Mater. Eval., 46, , 90-96 (1988). B.D. Sollish, Ultrasonic Velocity and Thickness Gage, United States Pat. No. 4,056,970, Nov. 8, 1977. L. Pichè, Ultrasonic Velocity Measurement for the Determination of Density in Polyethylene. Polymer Engineering and Science, 24, , 1354-1358, Mid-Dec. 1984. I.Y. Kuo, B. Hete, and K.K. Shung, A novel method for the measurement of acoustic speed. J. Acoust. Soc. Am. 88, , 1679-1682, Oct. 1992. D.K. Hsu and M.S. Hughes, Simultaneous Ultrasonic Velocity and Sample Thickness Measurement and Application in Composites. J. Acoust. Soc. Am. 92, , Pt. 1, 669-675, Aug. 1992. V. Dayal, An Automated Simultaneous Measurement of Thickness and Wave Velocity by Ultrasound, Experimental Mechanics, 32, , 197-202, Sept. 1992. M.S. Hughes and D.K. Hsu, An Automated Algorithm for Simultaneously Producing Velocity and Thickness Images, Ultrasonics, 32 , 31-37, 1994. D.J. Roth, Single Transducer Ultrasonic Imaging Method That Eliminates the Effect of Plate Thickness Variation in the Image. NASA TM-107184, 1996. D.J. Roth, et. al., Commercial Implementation of Ultrasonic Velocity Imaging Methods via Cooperative Agreement Between NASA Lewis Research Center and Sonix, Inc. NASA TM-107138, 1996. D.R. Hull, H.E. Kautz, and A. Vary, Measurement of Ultrasonic Velocity Using Phase-Slope and Cross-Correlation Methods. Mater. Eval., 43, , 1455-1460, 1985.